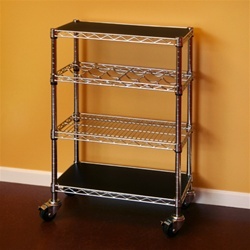 Chrome Wire Kitchen Kit 14"d x 36"w x 34"h Wine Cart. 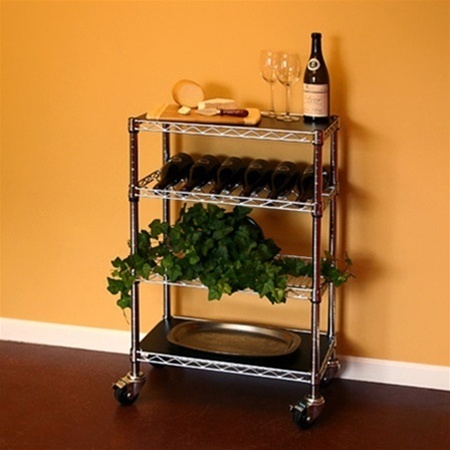 Our Wire kitchen kit wine cart is perfect for entertaining guests and convenient for everyday use. One wine bottle shelf is provided and can hold up to 9 bottles of wine. Use flat shelves for serving plates, food or beverages. Liners for 14"d wire shelving are sold separately.